Today is Presidents Day, a national holiday that first appeared in 1971 as part of the congressional act that shifted many U.S. holidays to Mondays. The precursor to the holiday was George Washington's birthday, which originally was celebrated every February 22. 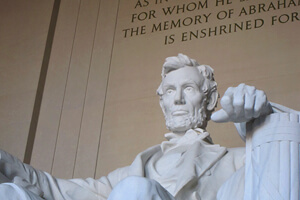 Due to the date's proximity to the birthday of Abraham Lincoln on the 12th, the renamed holiday became a tribute to Washington, Lincoln and all United States presidents. Enjoy this clip of the Garfield Cadets' 1975 rendition of Aaron Copland's "Lincoln Portrait," complete with a re-creation of DCI Hall of Fame member Bobby Hoffman's peace sign drill formation that first appeared in the corps' 1970 show. Legend has it that an official at the 1970 VFW Nationals in Miami objected to the peace movement protest form as being inappropriate for inclusion in a contest sponsored by a veterans' organization. Hoffman convinced the official that the form was not a peace sign, but a Mercedes Benz hood ornament. Considering that the entire Presidents Day weekend is well-known as a special sales event for American auto dealers, the Mercedes Benz account is perhaps just one of many stories of how Bobby Hoffman was ahead of his time.